It is estimated that 1 in every 2 women will experience a UTI in their lifetime and for 20% of them, UTIs will be recurring Because of anatomical differences, UTIs mostly affect women but men are also susceptible. With painful and irritating symptoms like burning sensation when urinating, passing frequent, small amounts of urine, discolored or cloudy urine, and for women, pelvic pain, UTI prevention and maintaining optimal urinary tract health is imperative for everyone. This review is going to examine Pure Formulas Cranberry. Cranberry is taken as a way to prevent UTIs from occurring. Pure Formula’s potent cranberry concentrate offers antioxidant protection and works to reduce and flush out unhealthy bacteria and toxins from the body. The manufacturer claims that their cranberry concentrate can help prevent bacteria from sticking to the walls of the urinary tract which can potentially lower the reoccurrence of UTIs. The only active ingredient is Cranberry. It is believed to work in the treatment of urinary tract infections by making the urine acidic and therefore unlikely to support the growth of bacteria. It is also believed that some of the chemicals in cranberries keep bacteria from sticking to the cells that line the urinary tract where they can multiply, therefore potentially preventing, but not treating, UTIs. Pure Formulas Cranberry recommends taking one capsule daily or as instructed by your doctor. If you are pregnant, nursing or under medical supervision, you should consult with your doctor before taking this supplement. 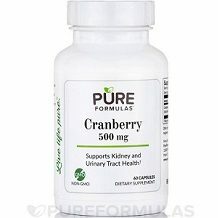 Pure Formulas does not list any possible side effects on their website, however, common side effects associated with consuming cranberry are the increased risk of kidney stones, low stomach acid and inflammation of the stomach lining. Pure Formulas lists Cranberry for $9.60 per 60 capsule bottle. There is a 10% discount offered for purchasing 3 or more bottles. Pure Formulas offers a 30-day money back guarantee on all unopened items. No refund is offered for opened items. Pure Formulas Cranberry offers a good dosage of cranberry per capsule. Aside from that, it was unclear what Pure Formulas offers over its competitors. Their website offers information about the general benefits of taking a cranberry supplement but it does not explain what was unique about their product or what made them a better option over other lines of cranberry supplements that offer equal or more benefits. In our pursuit of finding out more information about this product, we found nearly no positive reviews or more information about the effects of this supplement. 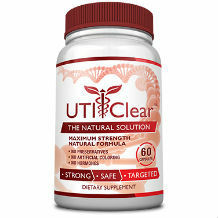 Untreated UTIs can travel up to the kidneys and cause potentially life-threatening damage so when looking to take a supplement as a preventative measure we want to know that we’re getting the best. With so many cranberry supplements on the market that offer better guarantees, bulk purchasing options, and additional benefits, we are steered towards looking into other cranberry supplements that have more positive consumer testimonials before investing in Pure Formulas Cranberry.